Are You A Winner, Or Not? Here's something you may not know... did you know there is more than one way to confirm that your Scratch ticket is a winner? The best way to confirm it's a winner is to take it to your favorite retailer and ask them to check it for you on the Lottery terminal. The next best way is use a Lottery Ticket Checker that is available at select retailers. You can also use the Lottery's mobile app to scan the barcode underneath the scratch-off coating. But there is also another way! 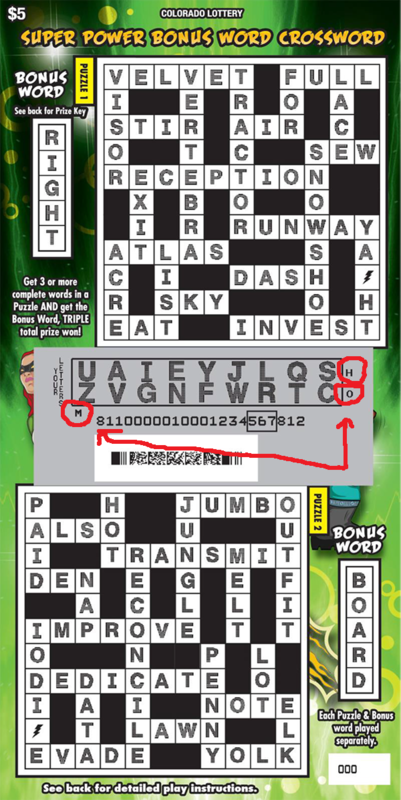 Each Scratch ticket will have, under its scratch-off coating, letters of the alphabet that will correspond to a prize. If you're ever confused about a game (some times they can be tricky), take a look at the hidden letters revealed. They may surprise you! Check out where the letters are hidden on the above "uncovered" ticket. Looking at the Validation Codes, do you know the prize of this ticket?